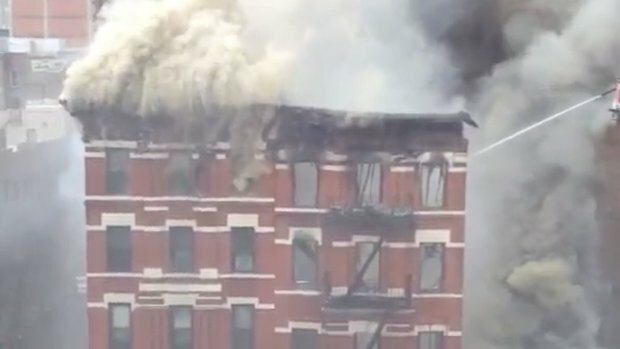 Investigators are looking into whether construction workers inside a sushi restaurant in the East Village may have accidentally hit a gas line, causing an explosion that injured 25 people and left two people missing, sparked a massive fire and caused three buildings to collapse, law enforcement sources tell NBC 4 New York. 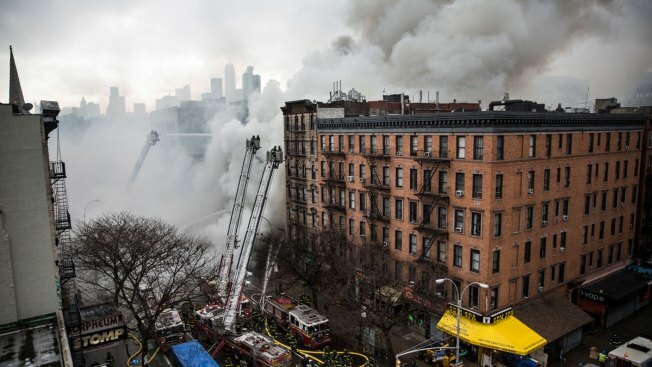 The explosion inside 121 Second Ave., between East 7th Street and St. Marks Place, caused the buildings at 121, 123 and 119 to collapse after they became engulfed in flames, according to city officials. No. 125 was still burning early Friday morning. The explosion injured 25 people, including four firefighters and one EMS worker. Two people are still unaccounted for, fire and police officials say. The approximately 250 firefighters on the scene have managed to contain the 7-alarm fire to those four buildings, and are expected to stay "for a very long night," said Fire Commissioner Daniel Nigro. "The initial impact appears to have been caused by plumbing and gas work that was occurring inside 121 Second Avenue," said Mayor de Blasio at a news conference Thursday evening. Officials say four of the civilians were critically injured, and seven others had minor to non-life threatening injuries. Three others were evaluated on the scene and didn't need medical attention. The most critical patients have respiratory burn, according to officials, which is different from smoke inhalation and is caused by the inhalation of hot gas or burning particles that result in tissue damage to the respiratory system. Family members said Friday they were searching for 23-year-old Nicholas Figueroa, who was on a lunch date at the sushi restaurant during the blast and has not been heard from since. Concerned relatives or friends that believe someone else may be missing are urged to call 311. There were no calls to either 911 or Con Ed reporting any type of gas leak or concerns before the explosion, de Blasio said. However, shortly before the blast, Con Ed inspectors were at the site to evaluate work the building plumbers was doing in connection with a gas service upgrade, according to Con Ed President John McAvoy. Con Ed said the restaurant was swapping a single gas meter for multiple gas meters as part of a renovation, but the work failed the inspection, partly because there was insufficient spacing for a new gas meter in the basement. The inspectors gave instructions on what changes were needed, then left. About an hour later, a worker who opened a door to a closed area of the kitchen smelled gas and tried to start an evacuation, according to a source close to the investigation. That's when the explosion occurred. Huge flames were shooting out of the front of the buildings at the height of the blaze, and thick plumes of white smoke could be seen billowing from the structures in the tightly packed, business-heavy neighborhood. The flames and smoke could be seen from at least 20 blocks north, and the smell of smoke was detected as far north as midtown, including at the NBC offices at Rockefeller Center. People were seen laying on the ground in front of the restaurant, apparently unconscious, immediately following the explosion, multiple witnesses told NBC 4 New York. A neighbor who lives on Second Avenue and East 7th Street told NBC 4 New York he was home when he heard a loud explosion that "shook everything." "When I went outside, I saw people running and broken glass everywhere," said the neighbor, David Hollands. Others described hearing something like a bomb or a car crashing through a store. Hollands said the storefront at 121 Second Ave. was entirely blown out, with glass strewn over 200 feet. He said within two minutes, at least 20 fire trucks rushed to the scene. Hollands' building and others nearby were evacuated, and firefighters continued to push back residents further away as the collapse danger zone expanded. Another witness, Lorne Colon, said he saw the "entire building explode" and that there were "definitely people inside the restaurant." "Within minutes, there were hundreds of people on the street," said Colon. A resident at 124 Second Ave. across the street, Larry Gregory, said he saw several people laying on the sidewalk in front the restaurant after the "loudest explosion I've ever heard in my life" and that others "were running around in a panic." A sushi restaurant exploded, likely from a gas leak, sending plumes of smoke into the area. 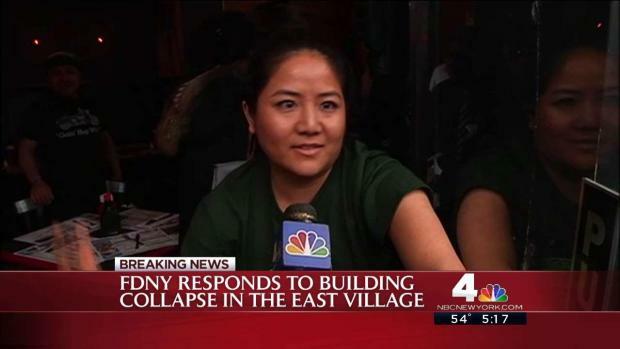 A man was at a nearby Starbucks when a building in the East Village exploded. Gregory, the neighbor across the street, said acrid smoke was permeating the neighborhood in the aftermath of the explosion. Fire radio transmissions captured by Broadcastify.com reveal the collapse threat firefighters faced as they "made extremely dangerous searches" for people possibly trapped inside, according to Nigro. One radio dispatch could be heard: "All incoming units are advised not to enter the building at all. We're going to pull them out of the building and off the rooftop. All units responding to Box 436, remain outside the building. Do not respond." 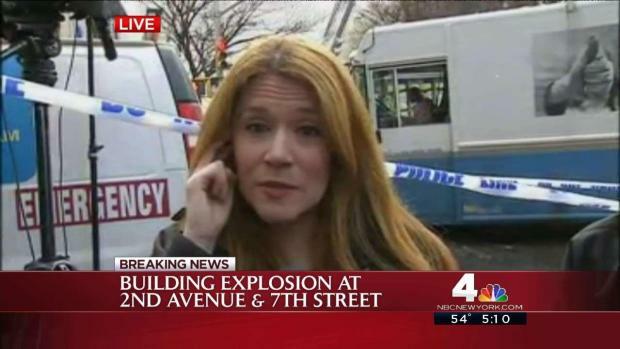 A woman near by the explosion site said it sounded like a bomb or a car crashing onto a building. "The first two floors of 121 are totally collapsed. It's a five-story, non-fireproof building. We're totally involved with fire at this time," another dispatch stated minutes later. Con Edison were shutting down gas service in the area as a precaution. During the restaurant renovation at 121 Second Ave., gas service was supposed to be cut off, according to Con Ed officials, so investigators are now looking into what fueled the explosion. The utility said it was looking into whether gas complaints were filed there recently. The private contractors doing the work inside the restaurant have not been identified. The Red Cross has set up a relief center for affected neighbors at PS 63, at 121 E. 23rd St.
Office of Emergency Management Commissioner Joe Esposito said a crew will be working to get rid of as much debris from the explosion -- like the splintered wood, bricks and glass -- as quickly as possible. Esposito urged neighbors to keep their windows closed and to limit their time outside as much as possible. Those with respiratory or heart conditions should remain especially alert to conditions and seek medical attention immediately if they feel discomfort. An NYPD unit was seen setting up an air quality monitor at the scene. The health department said there was a rise in air pollutants that peaked at about 4 p.m. Thursday, but that number since declined to normal levels and wearing respirators or surgical masks was not necessary. Officials say the odor will linger in the area for a while, but it does not pose a risk to the public. The city will open a resident service center at the Tompkins Square Branch Library at 331 East 10th Street at 8 a.m. Friday.